I’ve been knitting a wee baby thing for a new person in the family. Noola is showing tremendous restraint, refraining from playing with the yummy-looking pointy sticks and the green string with the lumpy thing attached. She’s even abstaining from attacking my chair cover — that irresistible, delicious sheepskin that usually drives her wild with desire with its sheepyness. It looks like she might be plotting… Maybe she’s saving up her ferocious attack for when I leave the room. 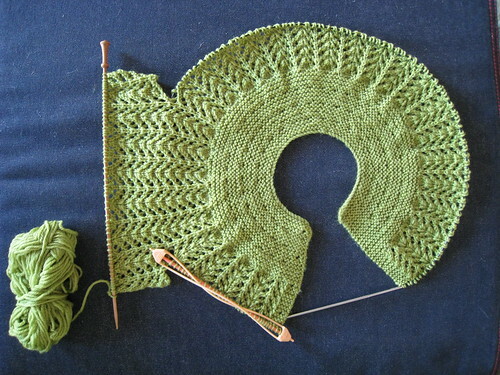 This entry was posted on Friday, March 16th, 2012 at 7:03 pm	and is filed under knitting & crochet. You can follow any responses to this entry through the RSS 2.0 feed. You can leave a response, or trackback from your own site. Ooo! That is lovely. Can’t wait to see the finished piece! your knitting just amazes me. 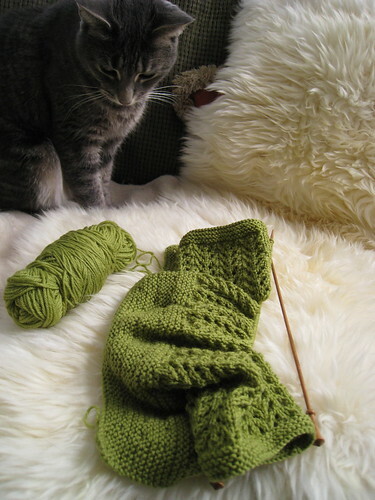 I am already working on socks for christmas, I have so many pair to make this year i am trying to spread them out.